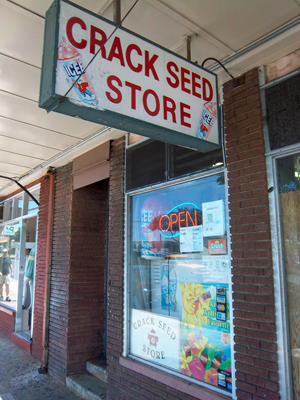 We recently returned to the Crack Seed store in Kaimuki. We wanted to revisit this iconic Hawaii tradition, especially inasmuch as the number of crack seed stores in Hawaii is in a rapid decline. It was no surprise that there was a waiting line to get in. That’s how popular the 40 year old mom and pop business is with locals (and visitors). We’ve gone there many times before but sometimes the line is daunting. Today we decided to experience it again. The Young Family is always more than helpful. We were given free samples to try. Newcomers are taken to the “bunny slope” for the first Crack Seed experience. Typically plum. The plum was sweet and salty. We are hooked and and always want more sensory overload. The samples will take you to the end of the Hawaii rainbow…. It’s all a matter of personal taste, and that’s where samples come in. Our favorites include the traditional dried plums in various forms including rock salt. Also lemon peel (how about 6 varieties). Also called Li Hing Mui, it’s a Hawaii snack delicacy of Chinese derivation. Crack Seed came from a time when travelers packed sweet and salty dehydrated fruits to supplement plain rice. The salt replenished what was lost due to heat and also acted as a natural preservative for the fruits. Chinese immigrants brought this tradition to Hawaii in the mid-1800’s and it’s remained popular ever since. In case you’re wondering, The Crack Seed Store sources their products from Taiwan, Hong Kong and Thailand. Head to The Crack Seed Store. The Crack Seed store located in Kaimuki (Honolulu) is the real deal for the best in Hawaii. Under the same ownership of the Young family for decades, you’ll get help, free samples, and find a plethora of large glass jars filled with tasty delights. It isn’t cheap (compared with Long’s) but the quality is incomparable. Look for the traditional plums and lemons to mango, strawberry, lychee, and more. Depending on the time of day you arrive, there may be a fast-moving line streaming out the door. Don’t let that dissuade you. This uber-popular store has been featured in newspapers and magazines, and you’ll soon find out why. The Crack Seed Store, 1156 Koko Head Avenue, Honolulu. Street and metered parking nearby. Open every day except Sunday. Is there anywhere you can mail order crack seed ? Thank-you ! Doris Place in Holualoa upcountry on Kona side of Big Island is great…. if she is still open. It’s been a couple of years …. Any suggestions on the Big Island to try crack seed? Kawate Seed Shop in Hilo. Google maps state it is permanently closed! But we will check it out this week. Google maps is showing it is open upon checking just now. And we were there very recently. Let us know if something has changed. I used to love it. But now I have an allergy to MSG and crack seed is loaded with it. Dang. Any recommendations for crack seed in Maui? We’ve heard good things about Camellia Seed Shop in Kahului. Let us know. Camellia Seed in the Kaahumanu Mall is da bomb! There used to be a little hole in the wall up towards Wailuku called Working Mommies, but they either closed or moved, no forwarding. Kaimuki crack seed is the best!